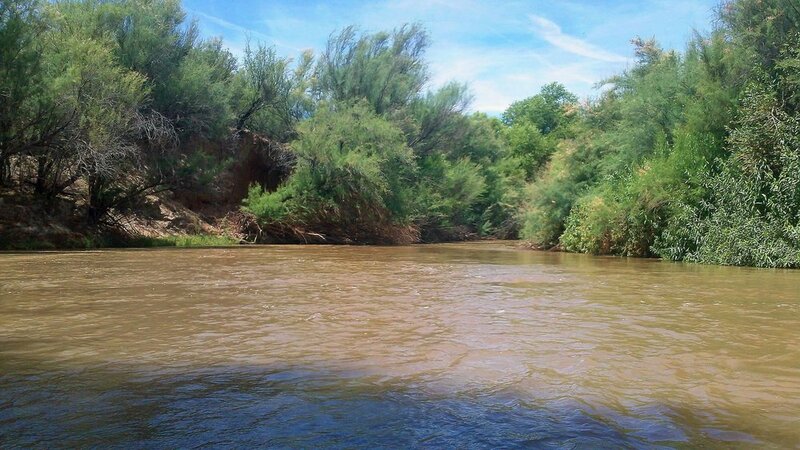 The Gila River was flowing at a yearly high rate (357 cubic feet per second-C.F.S.) and I received a phone call from Billy Joe, an adventurer who also has type 1 diabetes. Google unveils a record flow at Winkelman (our entrance point) of 55,000 C.F.S.! A slight difference from our day on the river but it would be enough flowing H2O to make things interesting. Initially, I was to join Billy and a friend to support his journey down the Gila River from Winkelman to Kearny, Arizona. The Gila River is not a large flow of water but for the arid desert Southwest it is a vital piece of the life puzzle for the area. It is not a deep river, although I can share that in many points it was over my head. We will get to my means for analyzing this fact, later. Billy Joe on the L. Photo by Billy Joe's friend. I would receive a phone from Billy the night before the trip and he had secured a 2nd kayak so that I would be able to join him on the river instead of along the river. While I have a decent background of sea kayaking this would be my first time to river kayak. No spray skirt nor bear spray. With a bright and early start I scrambled to pack items for the trip. My nature is to start packing well before an outing and meticulously go over the details. I am a planner and know that I need/want diabetes supplies, safety and camera gear, food, etc. I headed out the door a little short on the full list of items. While I am not aquaphobic, I dabble in some level of -ic that is right below aquaphobic (water panic). The journey would start well and gave the indication that it would be a simple float. River was moving us along at a good clip and thick, lush vegetation crowded along the vital water source streamed by. Soon the river narrowed under a railroad bridge and the nestle of branches and trees encroached upon our water highway and revealed a drop off. Grabbing nearby foliage, we analyzed our situation and decision to 'ride' the drop or negotiate around it. Negotiation appeared to offer minimal opportunities so we rowed forward. No problem and we continued on our way to Hayden then Kearny. At some maze of roots and branches and a narrow point with a funnel of faster flowing water I ran into a low hanging branch. When this happens the outcome is somewhat settled. You can do your best to push off, duck, or skirt the 'object' but if the current is flowing in its direction and/or you pick a less than adequate line, you will be stopped. While you may be furiously tackling the water with your oars the liquid freight train continues forward and the laws of physics begin to evolve. I was flipped. Billy Joe taking it easy. The only good landing area we saw until near the extraction point. Into the river I went and I was now submersed, pawing upward to break the surface. At the same time, you, the kayak and your oar are riding the current, thankfully at the same speed. At this point it is a crushing reality that I need to keep that kayak in my grasp and capture the oar. Pure misery if any of those vital pieces got caught up in the thickets and I was still moving downriver. Really difficult to land on the steep slopes and go back upstream to retrieve anything. Billy Joe's Video on our kayak adventure. This is not the first time I have been introduced to a body of water while kayaking. During an ocean kayak venture, I unvoluntarily exited the kayak and found myself in Sitka Sound (Alaska). Thankfully, it was close to shore and I had a spray skirt. Bobbing in the Gila River, I now had an open kayak that was now full of water. I knew how heavy 90 ounces of water was to run with. Imagine the weight of a boat full of water. Billy Joe had been just ahead of me but he was out of sight and screams to know that I had been hung up. I secured the oar, righted the kayak and found a spot to 'park' the kayak while I did some bailing to lighten the kayak and pulled it up the steep slope to turn over and drain the aqua pura. This would happen a number of times and I began to get more comfortable with an equation that would have overwhelmed me in the past. Do not ask me to go out on a raging river and practice kayak exits, but I was taking some steps (strokes) in the right direction by the end of the day to getting more comfortable in a watery environment. Me and my gear (I had tethered the living daylights out of my gear bag) did survive and I am happy that I had this opportunity. It was a learning experience and I realized that many things could have gone wrong. Yes, oh yes, the insulin pump brilliantly kept on ticking. Thankfully, we did not encounter these landmines and did have a memorable, but good ish time on the Gila River. I am working on a video of this. Take a deep breath!